Adrian Beaton always wanted to be an entrepreneur, but it wasn't until he and his family went axe throwing that his dream business plan came together. "I took it to my cousin Paul MacInnis, he was my first investor, and away we went," he says. "And it kind of just exploded." 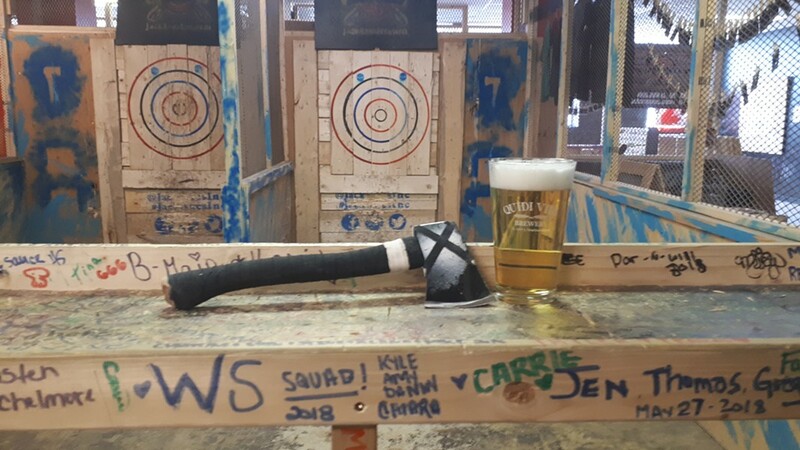 It was 2016 when the first HaliMac Axe Throwing location opened on a shoe string budget in St. John's, where Beaton currently lives, and it wasn't long after that the two Halifax natives opened a second location in Kentville. The next project? Opening their third lounge at 1920 Brunswick Street, right next door to 2 Crows Brewing Co. "It's almost our year anniversary and it has snowballed really really quickly. I opened it on a work term when I was doing industrial engineering technology, planning on massive growth ever since," says Beaton, who adds a Halifax location will be the icing on the cake. A place for "culture badasses," HaliMac will celebrate not just axe throwing, but art, craft beer and charity, too. "Every new location just gives us opportunity to improve ourselves," he adds, and Brunswick Street will be a more refined version of the first two locations. The six-lane set up will welcome not just large groups, but solo throwers too—HaliMac will charge per-person, not per-lane. "We operate in a pool hall or bowling alley fashion. You can come on your own, or with two. It really allows people to get exposed to the sport. We're building our own culture and our own community." Beaton says his aim is to open sometime in November, and it sounds like he's got some serious bullseye potential.